CARBONDALE, Ill. — Hannah K. Sweitzer’s photo of Southern Illinois University Carbondale’s iconic Paul and Virginia statue is the winner of the Student Center’s recent SIU ID Photo Contest. 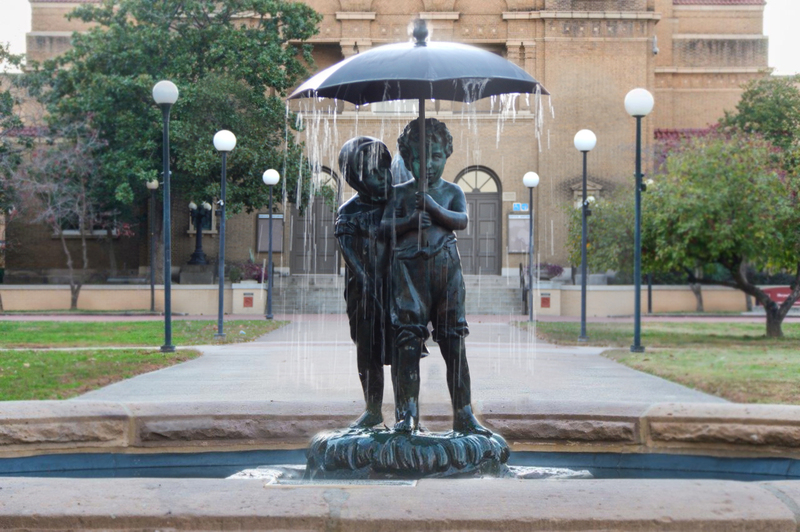 Sweitzer, of South Wilmington, captured the fountain’s water dripping from the whimsical couple’s umbrella with stately Shryock Auditorium as a backdrop. The original statue was donated to the university by the Class of 1887 and moved to Stone Center after Old Main burned in 1969. A duplicate, cast in bronze, was placed back in the original location and it has stood there for nearly a half-century. The class of 1965 decided in 2015 it wanted to make a lasting contribution to the university and led a fundraising effort to pay for a long-needed restoration of the bronze statue. Consideration was originally given to restoring and reinstalling the original statue but that wasn’t feasible. The 1970s bronze statue was refurbished by a sculptor and extensive renovation, tuck pointing and repairs of the fountain were undertaken. A recirculating pump and lighting were added. The vast majority of the approximately $57,000 in funding for the two-fold project came from the Class of 1965 with support and labor provided by Plant and Service Operations, according to Brad Dillard, director of Plant and Service Operations. The project, completed on time and on budget, has enhanced the appearance and energy efficiency of the statue and fountain while preserving it for future Salukis to enjoy, officials said. The project includes restoration of the Class of 1887 sculpture as well. A sculptor is currently working on that statue and it will return to Stone Center when the restoration is complete. Sweitzer, a senior speech communication major, received a $100 University Bookstore gift certificate as her prize for submitting the winning photo. The Paul and Virginia statue photo will appear on all official campus ID cards issued after Jan. 17, 2017. Students submitted nearly 150 scenic campus photos via Instagram or email for the competition.